Inspired by the works of M. P. Verneuil, Alphonse Mucha, and other Art Nouveau masters, 31 elegant designs celebrate the sensuous Art Nouveau style. The imaginative illustrations feature patterns of graceful swans, peacocks, butterflies, and other creatures, as well as intertwined vines, flowers, and other plant life. Pages are perforated and printed on one side only for easy removal and display. Inside this fascinating coloring collection, you'll find the characteristic curves of the art nouveau style providing an elegant backdrop for a variety of creatures from the animal kingdom. 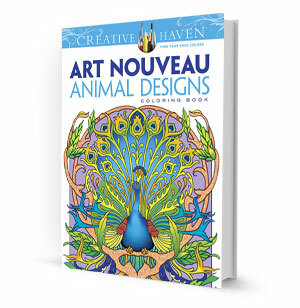 A unique coloring experience for artists of all ages, the designs inside this book feature birds, seahorses, horses, kangaroos, butterflies, and more. Finely detailed designs, selected from some of Verneuil's best-known collections, feature graceful images of garden flowers, reeds, and blossoming trees, as well as exquisite portrayals of fish, butterflies, birds, and other members of the animal kingdom.